With our winter weather fast approaching, it is important for families to have information up to date in Skyward Family Access to get notification of school closings. The Cameron School District will be using the Skylert/School Messenger which is tied to the Family Access/Skyward student database. This messaging system allows the District to quickly send out notifications in an emergency situation, school closing and reminders from individual schools. The following simple steps are required for you to receive the notifications the way you want to receive them. Go to www.cameron.k12.wi.us . 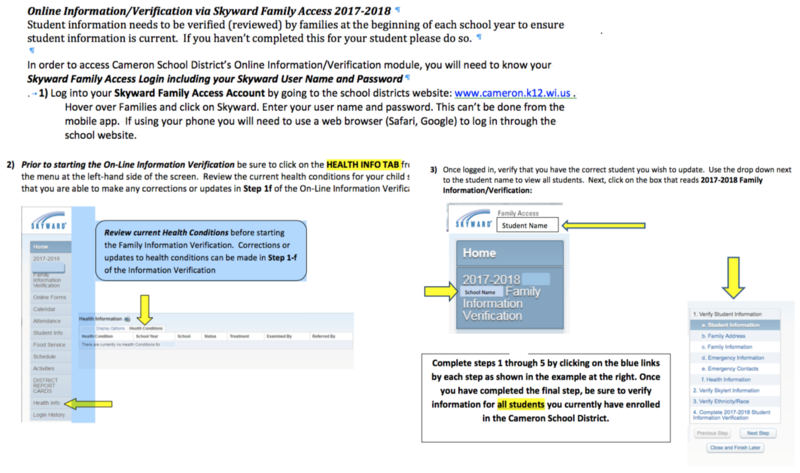 Select “Parents” from the top menu bar and then select “Skyward.” Families received log-in access information at the October conferences. If you don’t remember your login/password information, please contact your school secretary to obtain this information. Once in Family Access, click on the Skylert link on the left menu. In the upper box titled “My Skyward Contact Info” you will see the contact information you provided in the verification process. Please be sure that the phone numbers and email addresses are correct, and make any changes that are necessary. Any changes automatically update the information contained in your student’s Skyward record. The phone numbers provided in this contact area will only receive phone calls, not text messages. School Hours Emergency – for events that happen when school is in session, such as early closings due to inclement weather or other emergencies. Attendance – Our schools are not using this feature. If a student has not been called in absent a phone is made to families from the school office. General – for informational purposes only, these notifications will reference various district or school events and information such as a reminder about parent-teacher conferences. Non-School Hours Emergency – for events that happen when school is not in session, such as school closings due to overnight inclement weather. • Survey - not using at this time. Using the Skyward mobile app, families can view student information from a smartphone. This app can be downloaded from iTunes, Amazon app store or Google app store. To make changes to student information and/or schedule conferences in Skyward from your phone, you need to use a web browser instead of the app. For example, if you have an iPhone that comes with the Safari browser by default, you can use that to get to the Cameron School homepage (www.cameron.k12.wi.us) to access Family Access. Once on the web page choose Families, then Skyward and it will take you to the log-in page. Once you login, you will be able to make changes just like if you were on a computer. Contact your students’ school office if you need your username and password.